We only got through about half the cookies at the cookie party last night so this afternoon I finished the job. Here you see the fruits of my labor. 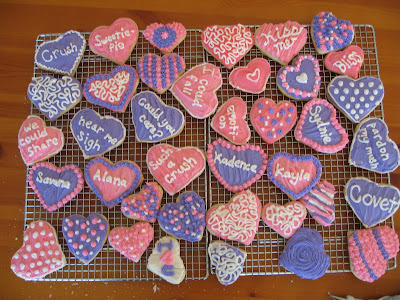 Most of the word cookies were inspired by a certain love song, this is where the contest comes in. 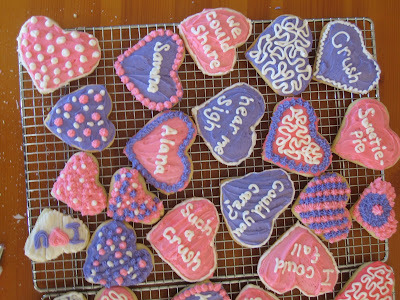 The first person to guess what song inspired the cookies will win! Not these cookies because, well, they’d be stale and you wouldn’t want them. 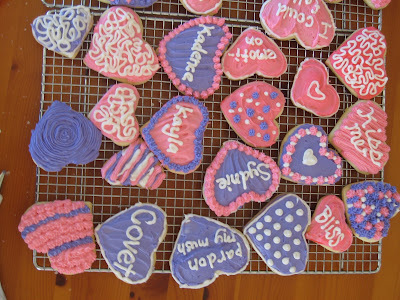 I will send you some fresh lovely cookies to enjoy. Hopefully, the husband will win and I won’t have to bother with postage! But I am not going to give him any clues so it will all be fair. I am making a mental note right this minute to stop singing the song so as not to tip him off. The names are not part of the contest, and there are 3 cookies with words having nothing to do the song in question. If there’s a word you can’t decipher, I’d be glad to clarify for you, just leave me a comment with which cookie you need translated. I suppose I should have a time limit, the natural day to chose as the cut-off would be Valentines day but I’m going to throw in an extra day in honour of my wedding anniversary. So, the contest will endalong with the 6th year of my marriage on February the 15 2008. Here are some closer photos for you.